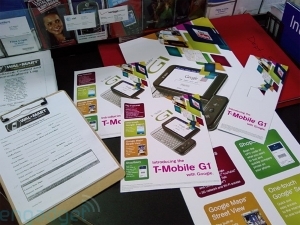 T-Mobile G1 heading to Wal-Mart | Android Blast! It looks like the T-Mobile G1 is about to get some serious exposure. According to engadget the G1 is heading to Walmart. The top ten Walmarts in each market will apparently receive the T-Mobile G1 on the 24th of November. The best part is that they are supposed to sell for $148.88 on a two-year contract. Way to go Walmart. If you can handle waiting another month for this phone you might just be in luck.